Working with a reliable appliance service technician, who can really help you fast and properly, is of the essence today. With Innisfil developing in one of the greatest residential areas in Ontario, there is need for all people to rely on capable professionals for their appliances repair needs. Whether home or commercial, all appliances have special importance to everyone and that's why the services of our Appliance Repair in Innisfil are not only effective but also immediate. We provide same day service and have the expert knowledge to fix commercial and home dishwashers, fridges, washers, dryers and all small appliances. The technicians of our company provide commercial and home appliance repair. With our expertise in all types of appliances manufactured by any brand, we can assure our customers that their needs will be covered efficiently. By having our vans perfectly equipped and a well-organized team, we guarantee that our response is quick. It's our duty to make improvements as far as our infrastructures and knowledge are concerned since appliances change over the years. Rest assured that we have knowledge of all these changes and, thus, the ability to repair, maintain and install the most high tech appliances with the same diligence and efficiency. Appliance Repair Innisfil is at the service of every client. We are at your disposal every day and whenever dryers, garbage disposals, microwaves or stoves give you trouble. 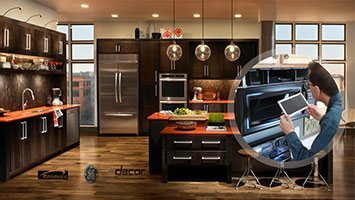 We offer small appliance repair, have great installation skills and maintain all appliances thoroughly. When there are urgent problems, you can trust our company for same day troubleshooting. We are able to find the problem, which caused malfunctioning, and have the means to fix it immediately. Our team is an expert in kitchen appliance repairs and has the capacity to help everyone fast. Do contact our company for all related needs. We are available and ready to assist you fast.